STC offers microcontrollers in various DIP and SMD IC packages. 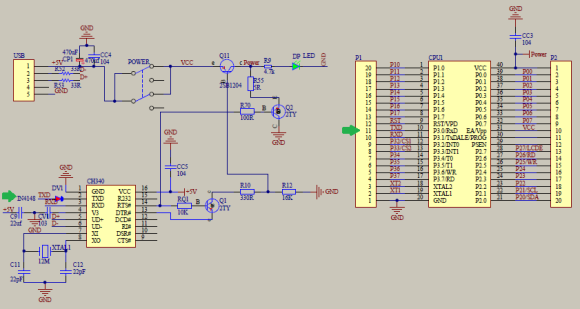 Thus, instead of using a 40-pin DIP package microcontroller to solve a problem that can be solved with an 8-pin SMD low cost microcontroller, we can avoid using a big microcontroller and thereby save valuable PCB space. Most STC 8051s are, by the way, 100% pin-compatible with other 8051s. This feature makes STC micros easy and viable replacements for devices that use standard 8051s. STC microcontrollers are relatively faster than common 8051s as they can operate at higher clock frequencies. For example, AT89S52 has a maximum operating frequency of 33MHz while STC89C52RC can be clocked with an 80MHz source. Some STC microcontrollers have in-built ADC, EEPROM, watchdog timer, external interrupt pins and other peripherals. Some are even equipped with higher storage capacities. These are not available in typical 8051s. Most 8051 micros need 4.0 – 5.5V DC supply voltage. Some can operate with 3.3V supplies too. Same goes for STC micros. However, there are some STC micros that are designed to operate at yet lower voltage levels. STC offers low power MCUs that operate between 2.0 – 3.6V and general-purpose micros that can operate between 3.6 – 5.5V. The operating voltage ranges and low power consumption figures of STC micros make them well-suited for battery and solar-powered devices. Most 8051s require a parallel port programmer while some require serial port programmer or separate dedicated programmer hardware. 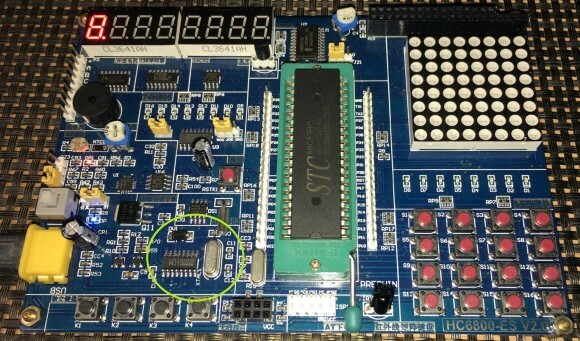 STC micros on the other hand can be programmer with a serial port programmer and so there is no need to buy a dedicated programmer. 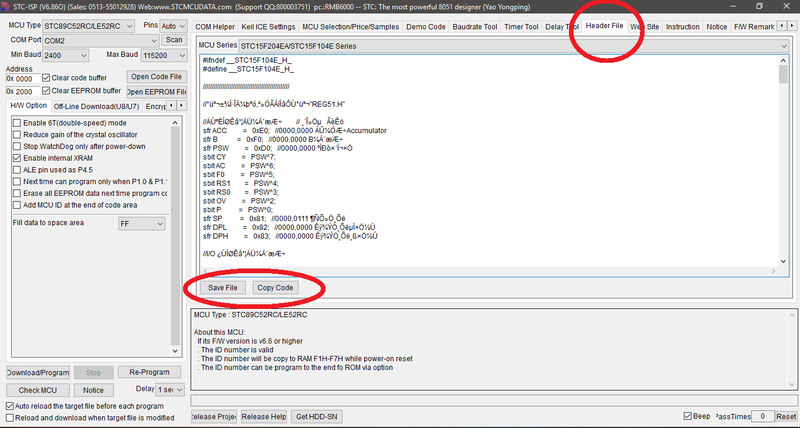 A simple USB-TTL serial converter can be used to load codes into STC micros. 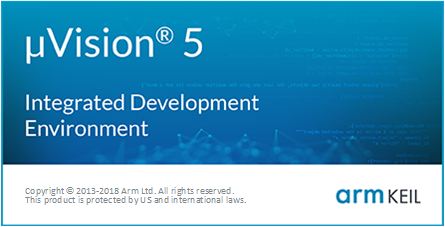 Other areas of differences include added/reduced functionalities/features. 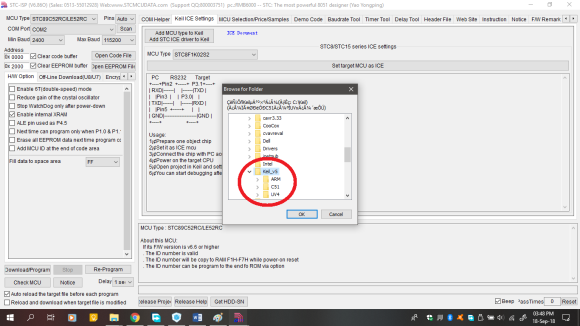 In some STC micros, there additional options for GPIOs, timers, etc while in some other devices these extras are not observed. 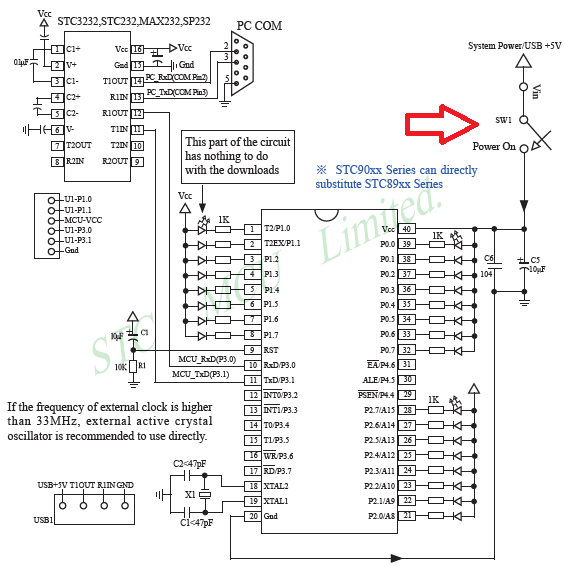 For example, in STC89C52RC, there is 13-bit timer mode for timers 0 and 1 but this feature is absent in STC15L204EA. 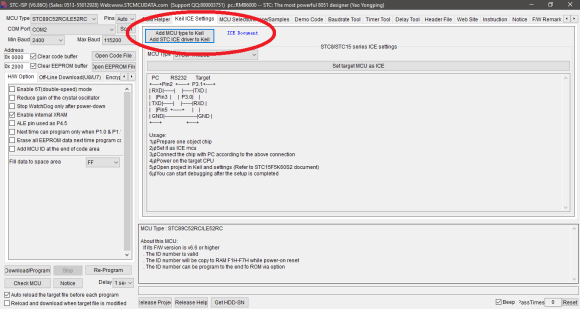 Likewise in STC15L204EA, there are many ways for setting up GPIOs which are not present in STC89C52RC. STC microcontrollers are popular in China and Chinese-speaking countries. Owing to this fact, most of the documentation and even the websites are in Chinese. It is hard to get English documentations. Fortunately, we will not be needing anything else other than device datasheets which are luckily available both in Chinese and English. From AliExpress, DX, Alibaba and other similar websites/stores, you can buy any STC development board of your choice. Alternatively, you can buy common STC chips and use them with your existing development board or setup a bread-board arrangement. 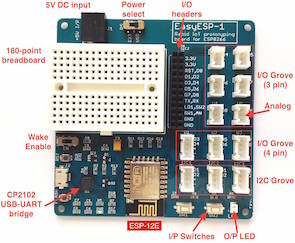 This board is designed to bridge a serial interface between a host micro and a nRF24L01 2.4GHz wireless communication module. 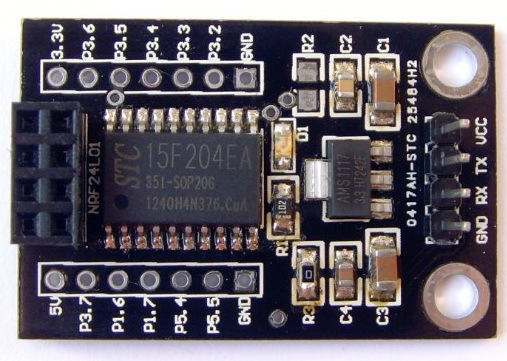 However, that doesn’t restrict us from using the STC15F(L)204EA micro embedded in it. If you just want to give STC micros a shot with very little investment then this sort of board is all that you can ever expect. In my tutorials, I’ll be using both kinds of boards but the main focus will be towards STC15L204EA or similar slightly non-standard 8051s since they are not like playing with typical 8051s. We will also need an USB-serial converter for uploading code. Apart from these, some regularly used hardware items like LCDs, sensors, wires, etc will be needed. These can easily be found in any starter kit and most are available in any hobbyist’s collection. Only two software tools will be needed. 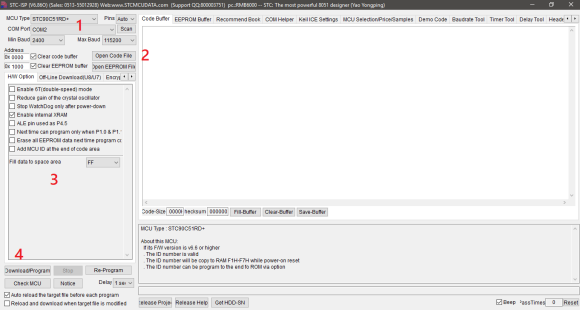 The first is Keil C51 compiler and second STC ISP tool. STC ISP tool can be downloaded from here. This is one helluva tool that has many useful features. 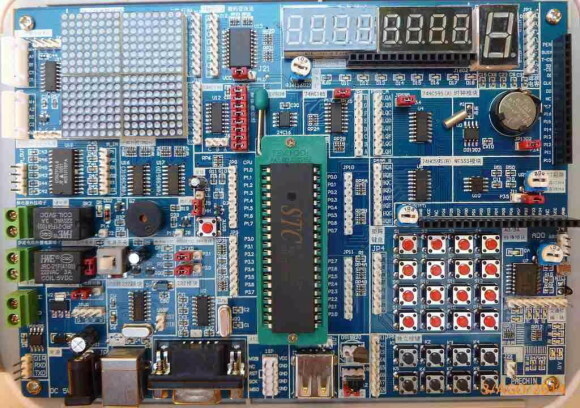 It a programmer interface, a code generator, serial port monitor, code bank and many other stuffs. It sure does make coding STC micros lot easier than you can possibly imagine. 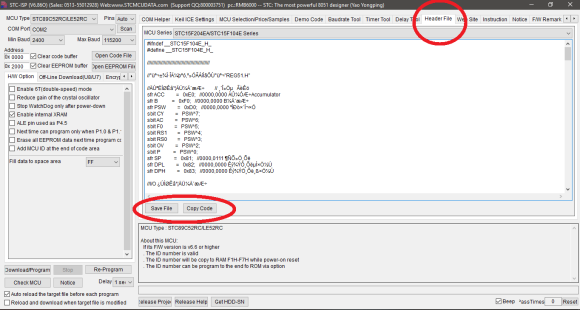 Keil C51 C compiler will be needed to code STC micros. At present, Keil is the only C compiler that can be used reliably to code STC micros. STC documentations speak of Keil mostly. If you want to use some other compiler like IAR Embedded Workbench, MikroC for 8051, etc other than Keil, your have to add the SFR definitions of your target STC micros and do other stuffs to familiarize it with the STC micro target. Alternatively, you can use models of other similar 8051 model. For example, STC89C52RC is similar to AT89S52. You can use codes for such interchangeably. However, this method won’t work in cases where we have more hardware peripheral than an ordinary 8051 micro. STC15L204EA, for instance, can’t be used like ordinary 8051 or like STC89/90 series micros. 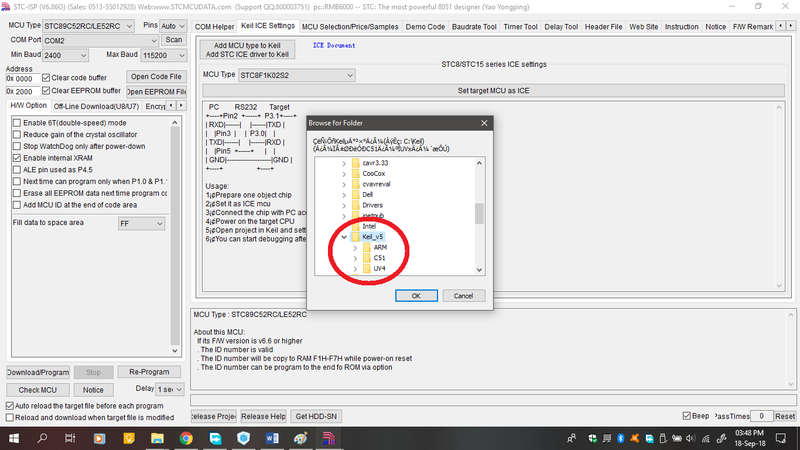 By default, STC microcontroller database is absent in Keil. It is imperative that this database is added to Keil when using it for STC micros for the very first time. Though this database is not complete in the sense that not chips are enlisted in it, it is still a must or else we will have to use unconventional coding methods by using models of similar microcontrollers of different manufacturers. Personally, I hate unconventional tactics because why use such methods when we can add the database easily. We only have to add this database once. 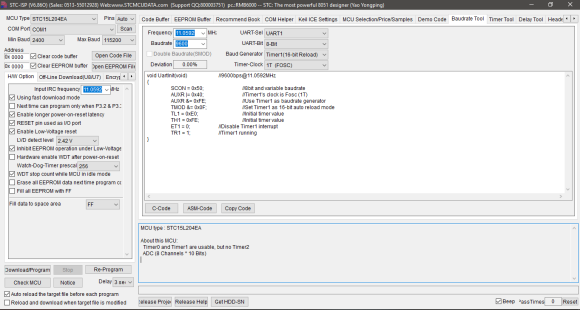 First run the STC-ISP tool. Don’t worry. 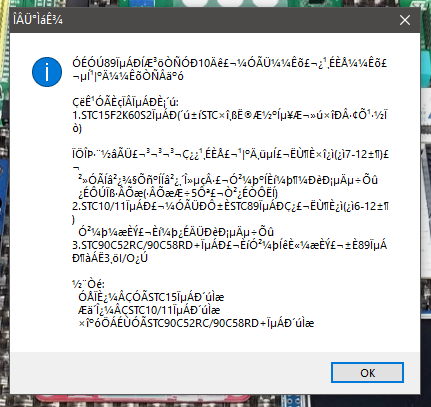 It is not an error or garbage text window. It appears so if you don’t have Chinese font database installed in your PC and so just click OK to continue. Selecting wrong folder will end up with an error and the database won’t be installed. Now run Keil C51 compiler. Select STC Database and appropriate chip or similar part number. Please note that your target chip may not be in the list. For example, the L-series chips are not enlisted in the database and so they are absent in the list. STC15L204, for example, is not shown in the list. You can use STC15F204EA instead of it as they are similar stuffs. The only difference is their power consumptions. You have to use such tricks when your target chip is not listed. 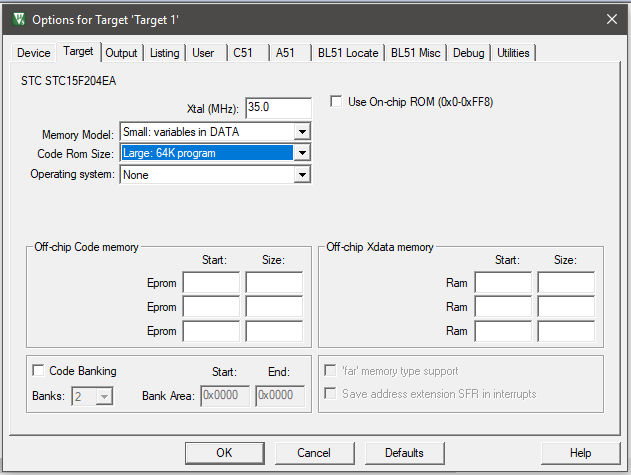 Make sure that the model you selected matches with the target chip or else things may not work properly. 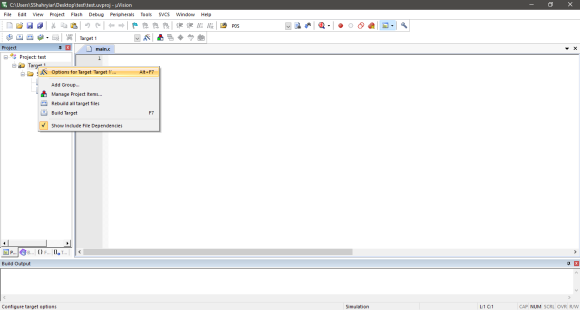 After chip selection, add the startup assembler file to your project. 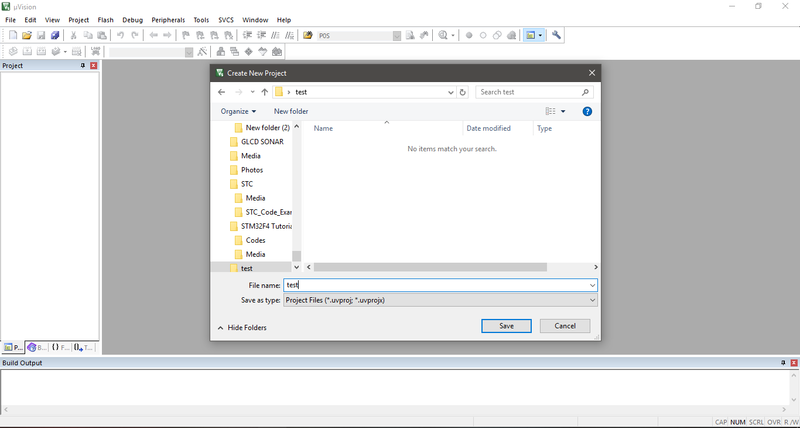 By default, Keil doesn’t add/create any file and so you’ll see that the project folder has no main source file. 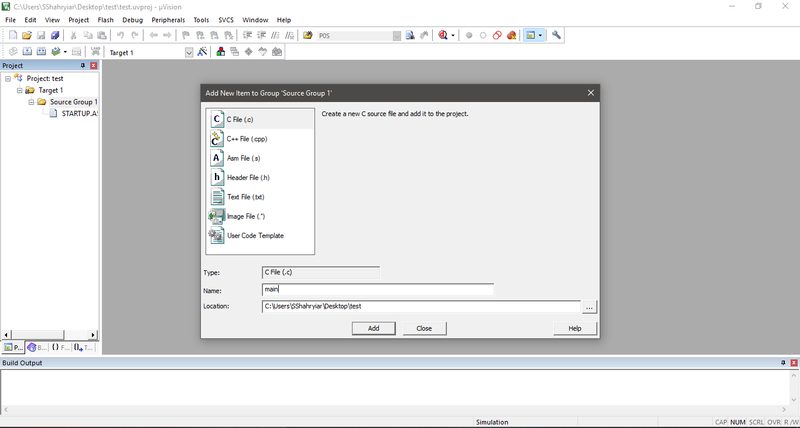 We’ll have to create one main source file and add additional files if needed. Still we are not ready to start coding. This is because we have not yet added SFR definition header file and other custom optional files. Again, we need to take the help of STC-ISP tool. 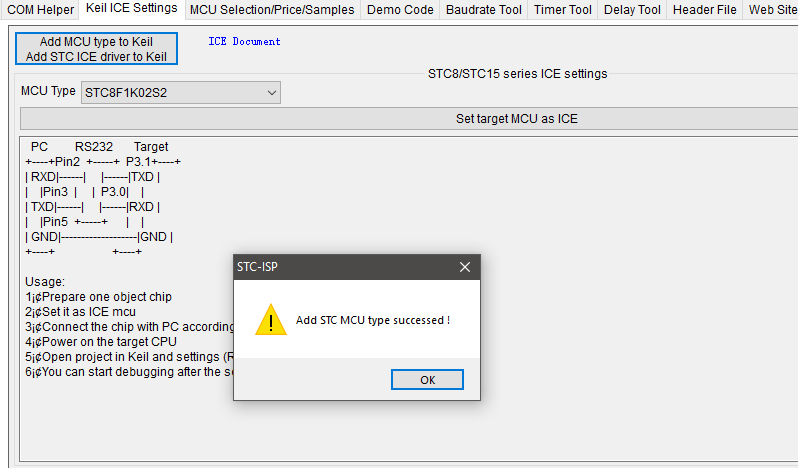 In STC-ISP tool, locate the Header File tab and select appropriate MCU series. Save or copy the file to your desired location. From this window select clock frequency and memory model. 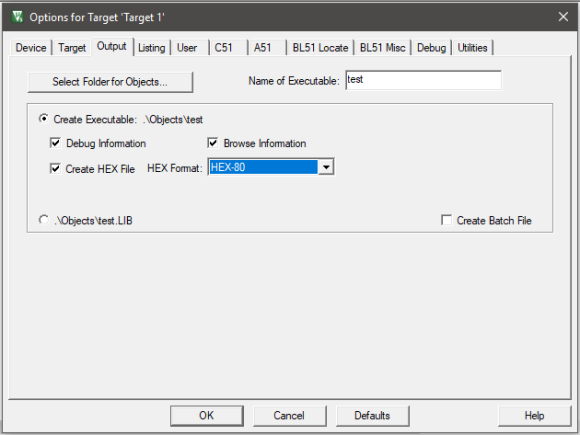 Select Create HEX File from this window as this file will be uploaded in the target chip. This section above is highly important because here we have to show the compiler the locations of the header or include files. Check the step numbering carefully. Lastly disable Warning Number 16. Now, we are good to code. I made a small Youtube video on all the above discussed processes. If you didn’t understand some part or if you are confused at some point, you can watch the video here. Now let us discuss about uploading codes to STC micros. 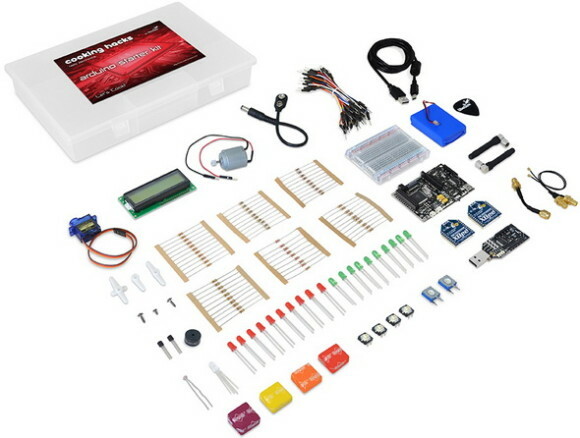 The most advantageous part is the fact that we don’t need to invest on a dedicated programmer as with other microcontrollers as a simple USB-serial converter will do the job. However, on first go things may look confusing. 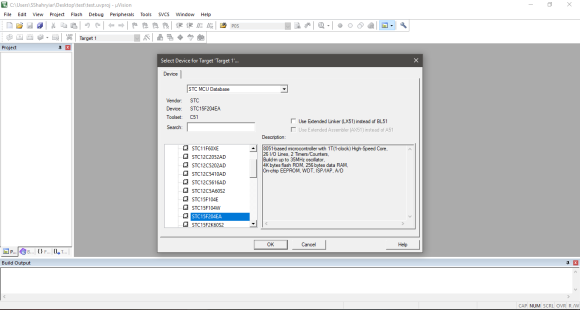 Shown above is the STC-ISP tool’s screenshot with numbers. We have to follow them one-by-one and in incremental order. 1 denotes that we must select the right COM port and part number. You can use Windows Device Manager to find out which COM port is being used for uploading code. Step 2 is to select the target HEX code file. 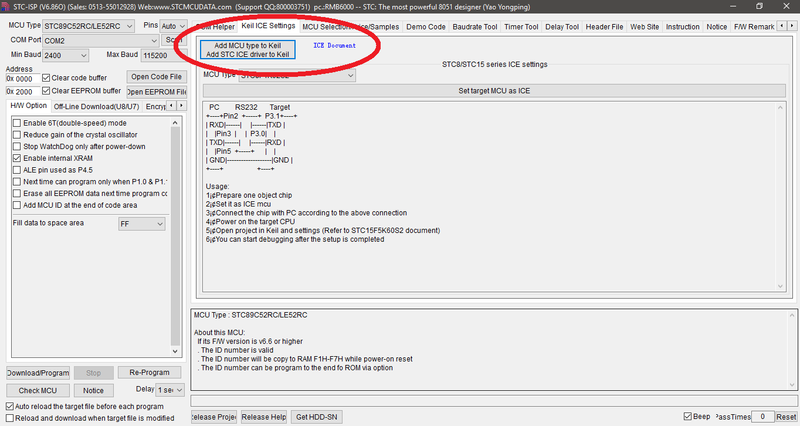 Optionally in step 3, we can set some additional internal MCU parameters. 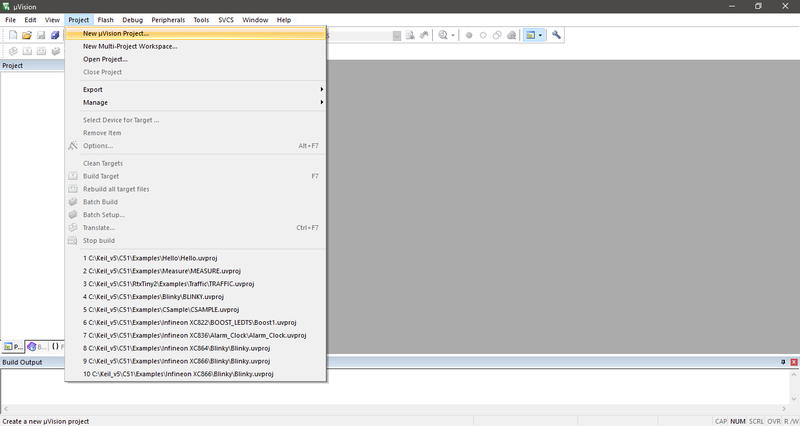 When everything has been set properly, we can hit the Download Program button shown in step 4. If the target microcontroller or board is already powered then the code won’t be uploaded. This is the confusing part because it should have been the other way. Notice the red arrow in the schematic below. The code is not uploaded by holding and releasing the reset button for some time or by pulling high or low some special pin or by some other means. We need to create a handshake between the PC and the target MCU and this is done when the MCU is powered off and then powered on, i.e. when the micro is powered up. This is why the red arrow highlights the power switch in the schematic. 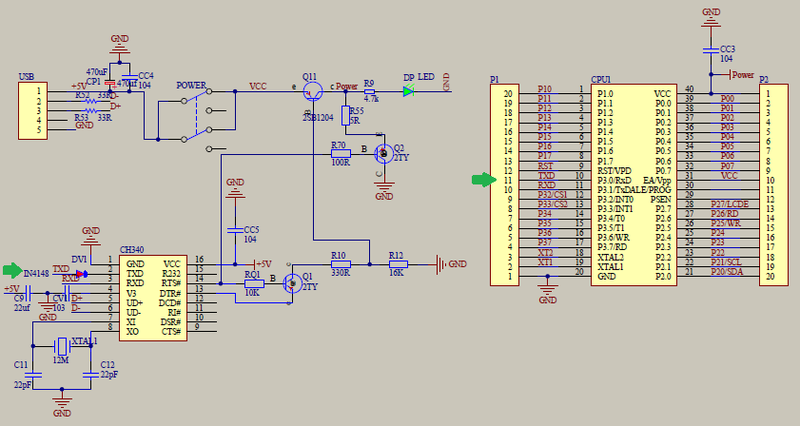 Though the schematic shows a MAX232-based converter, we can use a USB-serial converter instead. All of these steps are demoed in this video. Note that no external USB-serial converter/cable can be seen in the video as it is embedded in the board. The following schematic and photo will make this fact clearer. 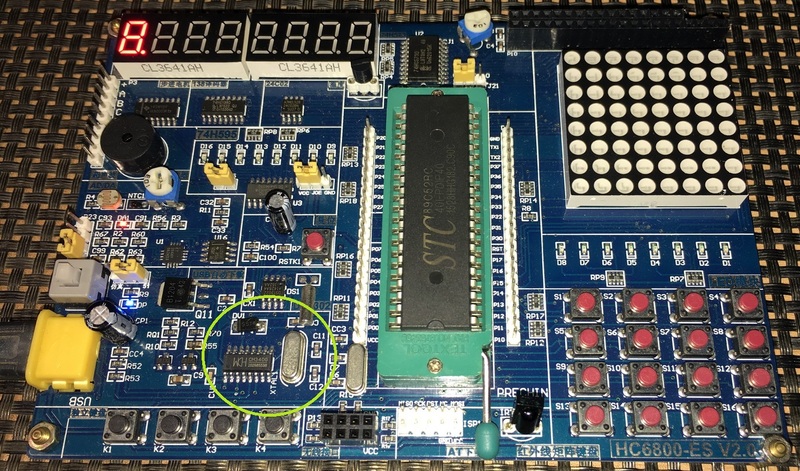 This is why most STC development boards come with such arrangement and without any programmer.